My relationship with Star started in 2008 when I began riding her out for a friend. I made the decision fairly soon after buying her to have her shoes removed and have had many moments of doubt since. 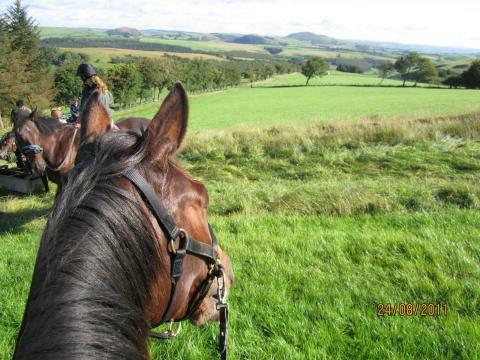 Unfortunately, I live in an area dominated by the hunting fraternity, and it feels as though I constantly have to defend my decision to keep her and my other mare barefoot. I signed up for a four day long distance ride in August and my doubts about her hooves increased ten fold. 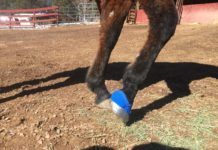 That’s when Star’s hoof trimmer suggested I buy a pair of hoof boots. 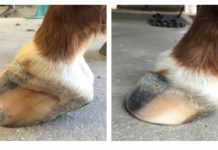 I bought a pair of Easyboot Edge hoof boots and we haven’t looked back. They stayed on through bogs and rivers, over rocky terrain and on the beach. They didn’t rub and after a brief stint of walking like John Cleese from a Monty Python sketch, she adjusted well to them. 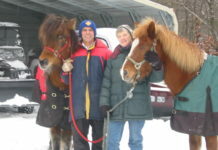 Out of 35 horses on the ride, she didn’t have a moment of lameness or hold everyone up due to a loose or thrown boot. There were no overreach or brush injuries sustained and she had no less grip on wet grass than any of the other horses. It felt like a huge victory and she was a fantastic ambassador for barefoot/booted horses. I also rode her the entire way in a Dually halter. Gasps all around! I am glad that I’ve stuck to my guns and Star is so comfortable in her boots. I’ve really noticed a difference in her out on hacks, aided also by the lack of a bit. My advice to anyone is to trust your instincts and listen to your horse and sometimes less really is more!